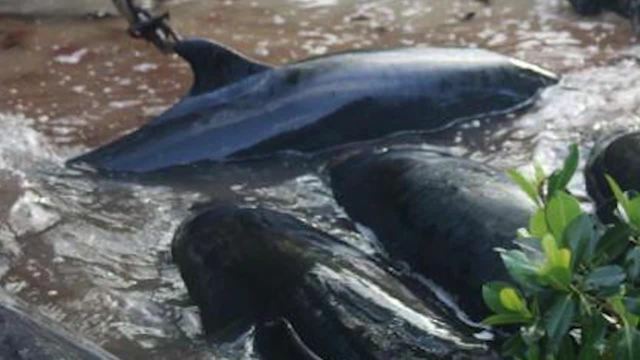 COLLIER COUNTY, Fla. -- Nearly 100 dolphins stranded off the coast of Southwest Florida in Everglades National park have died, the National Oceanic Atmospheric Administration reported Monday (NOAA). The false killer whales, a type of dolphin, were stranded off of Hog Key in Everglades National Park on Saturday. Despite rescue efforts by NOAA and other agencies, most of the false killer whales died, including ten that were euthanized. According to Mote Marine Laboratory, 95 false killer whales were stranded in total. 72 died on their own, 10 were humanely euthanized and 13 are unaccounted for. It is not yet clear what caused the pod to strand themselves. A marine biologist at the Bailey-Mathew's National Shell Museum said the dolphins may have gotten lost in the maze of mangroves in the national park. "Down in that area in Everglades National Park it's very shallow; very easily for even a human to get lost navigating through those waters," said marine biologist Stefanie Wolf. NOAA officials said many of the dolphins became entangled in thick mangroves. Wolf said it may have interfered with their ability to use echolocation to navigate the shallow waters. "They use echolocation for navigation and so they very easily, and gently scoping coastlines, can have problems with their navigation," said Wolf. "It could have been that the family group was disoriented and that's why they ended up on the beach there and stranded," said Wolf. A necropsy will be conducted to help determine the cause of the stranding. As of Monday afternoon, the area of the park where the stranding occurred was closed. According to NOAA, this large of a stranding is a rare occurrence and is the largest mass stranding of false killer whales in the United States. There have only been two previous strandings of false killer whales in Florida, one in 1986 in Key West where 28 whales stranded and another in 1989 at Cedar Key, which involved 40 whales and most of them were able to swim away; just three were beached.